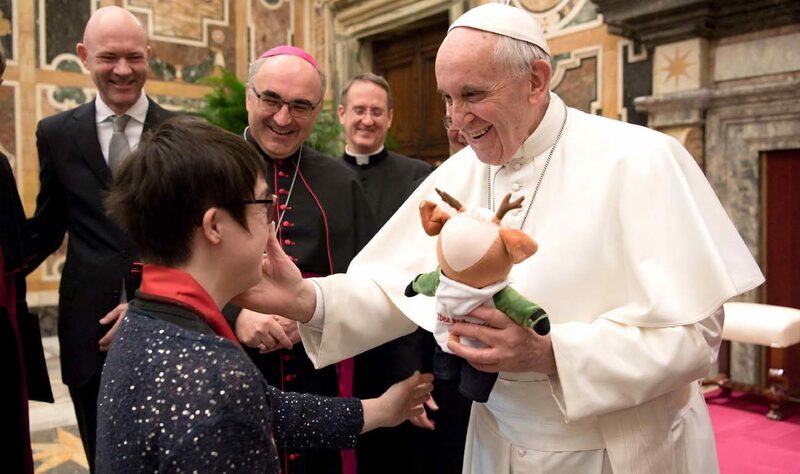 VATICAN CITY (CNS) — The athletes of the Special Olympics witness to the world the beauty and value of every human life and the joy that comes from reaching a goal with the encouragement and support of others, Pope Francis said. “Together, athletes and helpers show us that there are no obstacles or barriers which cannot be overcome,” the pope told representatives of the Special Olympics World Winter Games, which will take place in Austria March 14-25. Pope Francis praised the passion and dedication of the Special Olympians as they train for their events, and said sports are good for everyone, physically and mentally. “The constant training, which also requires effort and sacrifice, helps you to grow in patience and perseverance, gives you strength and courage and lets you acquire and develop talents which would otherwise remain hidden,” the pope told the athletes.